Heavy duty design holds up to 100 lbs. 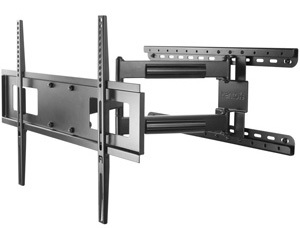 A great fit for both home and commercial installations, the FMC4 is a full motion TV mount that offers incredible versatility for your wall-mounting needs. 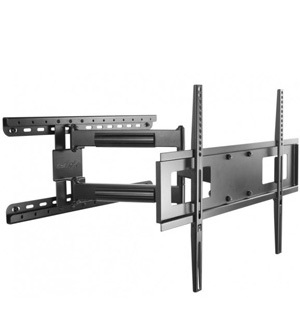 The adjustable pivot point lets you center your TV perfectly, or move it to either extreme if you need to wrap it around a corner or accommodate off-center studs. Heavy duty solid steel construction means this mount supports up to 100 pounds – plenty of strength for today’s bigger TVs. 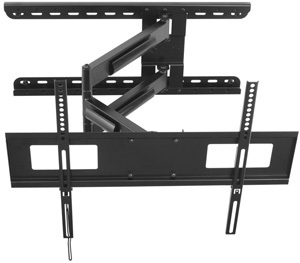 With almost limitless swivel capability and 26” of extension, this unique TV mount can meet almost any mounting challenge. TV Size 30" – 60"
A great fit for both home and commercial installations, the FMC4 offers incredible versatility for your wall-mounting needs. The FMC4 accommodates a range of VESA sizes from 100×100 all the way to 600×400. Confidently mount a TV weighing up to 100 pounds. Even at full extension, your TV stays in place with no sag. At maximum extension, your TV will sit 26" from the wall. The FMC4 features a sliding pivot point that can be moved 20” to the left or right. With this function, you can move the entire arm and TV plate laterally across the wall plate for a wide range of viewing options. Depending on the size of your TV and the amount of extension, the FMC4 can swivel 135° in either direction, depending on screen size. With this range of motion, your TV can be seen from almost every part of the room, or from a different room altogether! The ability to tilt 5° backward is useful for lower installations. For higher mount installations, tilting 10° forward allows you to find the perfect viewing position. To keep the angle of your TV constant, use the included Allen key to tighten the tilt tension on the two hex bolts located on the tilt head. An integrated cable management system allows you to route your power and video cables neatly between the TV and the wall. Keep your cables tidy and out of sight for a clean, organized look. Sometimes heavier TVs will twist slightly, especially if you shift your TV off-center on the TV plate. With a simple adjustment, level your TV horizontally for a perfect alignment. TV Size Capacity 30" - 60"
TV Weight Capacity Max. load 100 lbs. Feature Fits VESA Sizes TO 600x400 The FMC4 accommodates a range of VESA sizes from 100x100 all the way to 600x400. 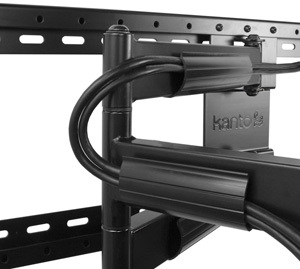 Supports 100 Pounds Confidently mount a TV weighing up to 100 pounds. Even at full extension, your TV stays in place with no sag. Extends Almost 24 Inches At maximum extension, your TV will sit 23.6" from the wall. Adjustable Pivot Point The FMC4 features a sliding pivot point that can be moved 20" to the left or right. With this function, you can move the entire arm and TV plate laterally across the wall plate for a wide range of viewing options. Swivels 135 Degrees Left Or Right Depending on the size of your TV and the amount of extension, the FMC4 can swivel 135° or more to the left or right. 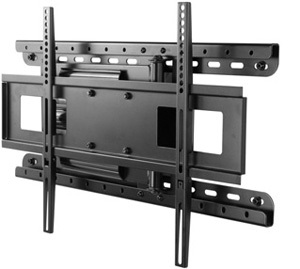 With this range of motion, your TV can be seen from almost every part of the room, or from a different room altogether! 15 Degrees Of Tilt The ability to tilt 5° backward is useful for lower installations. For higher mount installations, tilting 10° forward allows you to find the perfect viewing position. To keep the angle of your TV constant, use the included Allen key to tighten the tilt tension on the two hex bolts located on the tilt head. Sleek Cable Management An integrated cable management system allows you to route your power and video cables neatly between the TV and the wall. Keep your cables tidy and out of sight for a clean, organized look. Simple Leveling Sometimes heavier TVs will twist slightly, especially if you shift your TV off-center on the TV plate. With a simple adjustment, level your TV horizontally for a perfect alignment.